Need to send some luggage home from university? My Baggage can help! We offer fast, reliable and low cost student shipping from your university accommodation, straight to your home front door. 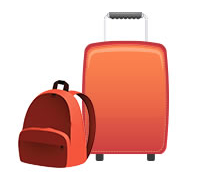 With My Baggage, as well as sending your luggage to university, you can also send your luggage home again at the end of term! It’s perfect if you need to take some belongings home with you over the holidays, or even if you’re being a little bit cheeky and sending some laundry home to be washed. Transporting your luggage can be quite an effort. If you’re flying home, paying for that extra bag on your flight can be expensive. Even if you’re travelling by bus or train, carrying a bunch of heavy bags with you can be near impossible. Sending your luggage home with My Baggage takes all of the stress off your shoulders. We’ll take care of your baggage, making your journey home as stress-free as possible. We understand that you can feel hesitant handing your personal belongings over to a student shipping company, because your main priority is keeping them safe. Thankfully, we’re experts at shipping luggage here at My Baggage as we help thousands of students send their luggage home every single term. We’ll always keep you in the know in regards to the whereabouts of your shipment as we provide full online tracking, as well as SMS and email notifications. And if that’s not enough – we have a dedicated customer service team ready to answer any questions you might have via phone, email and live chat. To make the whole thing as stress-free as possible, we provide a convenient door-to-door service to all houses, student houses, flats and apartments. That means we can collect from and deliver straight to your front door! If you are living in student halls at university and need your luggage to be collected from there, we can help. Our drivers are unable to access individual rooms for security reasons, however you can drop your items off at your university halls’ reception area or postal room and we’ll pick them up. Just be sure to check the whereabouts of these locations with your university before making your My Baggage booking. At My Baggage, we can be flexible around your journey home. You can choose your collection date when booking to ensure that your luggage arrives on time. 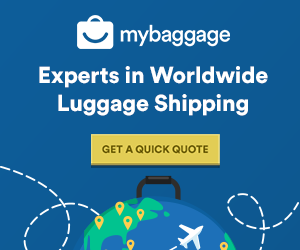 My Baggage sends luggage within the UK and Ireland and to over 200 countries worldwide. If you are an international student and need to send your luggage home for whatever reason, you can book with My Baggage too!